The 6 June, in addition to being the anniversary of the D Day landings, is the date I had been invited to give a talk to the Wiltshire Astronomical Society. I have always enjoyed visiting WAS. Not only are they a friendly bunch, they are keen to go outside and do some astronomy. Anyway, one of their member had noted that, later in the evening, the International Space Station (ISS) would pass over the gibbous moon. Although a relatively common sight, the path to see this sight is quite narrow and typically involves some travel. Luckily for us it would be perfectly visible from the centre of the Avebury Neolithic stone circle. This talk was about the Winter Star Party, a favourite event of mine that I have attended 3 times now . Each visit has been tremendous fun and worth every penny – particularly when one considers the typically inclement weather the UK enjoys each February. Once the talk was complete, the questions answered and club matters dealt with, we jumped into our respective cars and drove the short distance to Avebury. 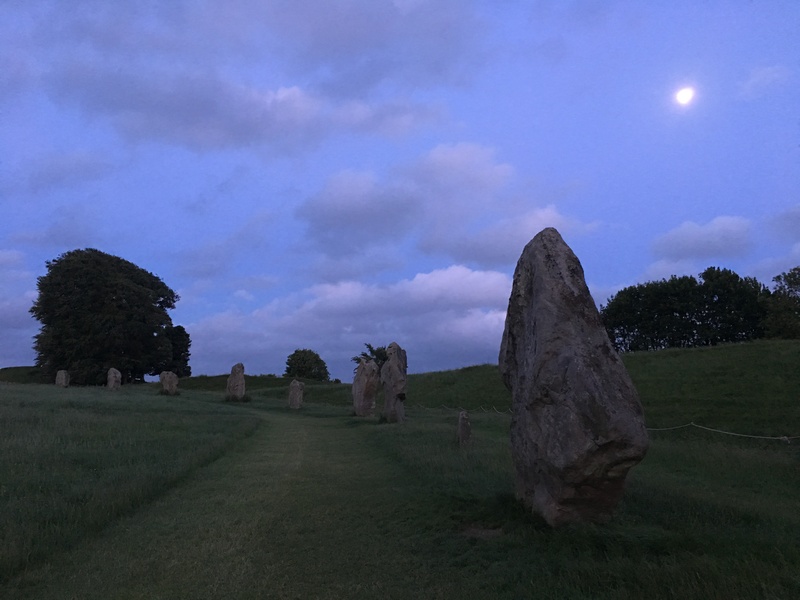 Avebury is a fantastic spot and well worth the visit – even without a space station in the sky. The stone rings were built thousands of years ago and provide a wonderful scene and atmosphere. The contrast between our Neolithic observing spot and the highlights of 21st century space technology were stark! No doubt the original builders could not imagine what we were seeing and likewise, we wonder how and why these massive structures were built. We soon found a spot that was relatively sheltered from the strong wind. The sky, though, was full of clouds with only the odd break here and there. I had my 300mm camera lens and a static tripod. There were a few wide-angle lenses and high-power telephotos while others had their binoculars to enjoy the show visually. As the transit neared, the sky thankfully began to clear although there was no respite from the wind. At the appointed time, the ISS rose above the horizon, appearing as a bright star. It quickly crossed the sky towards the moon. I centred the moon in the camera’s field of view and, as it neared the lunar surface, hit the continuous shooting button. As the camera clicked away, the ISS shot across the field of view. In fact, the whole transit only lasted 0.3s! 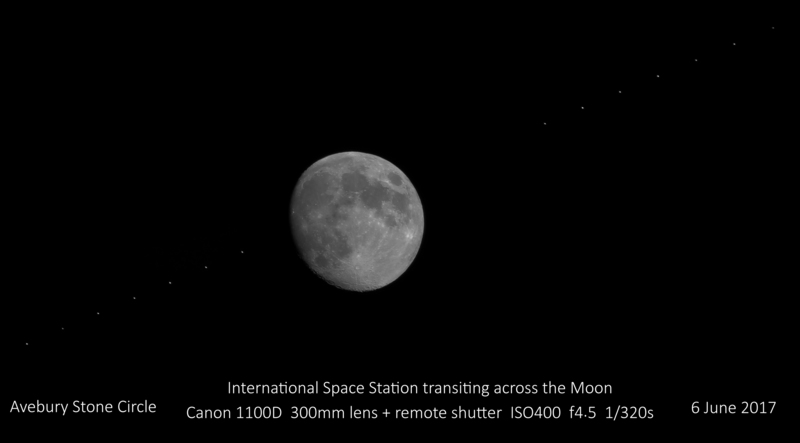 To my horror, the camera buffered at the moment the ISS crossed the lunar surface. The picture below, a composite of my photos, shows the ISS as it moved from top right to bottom left. I now have to look at for these events and see when the next one is scheduled so I can get a better photo.